I am a disabled performing artist who also writes theatre critiques. As a kid, the stage drew me in but well-intentioned family taught me that I shouldn’t aim too high; actors and their bodies had to be perfect. I was relegated to ensemble roles as if my disability would prevent me from inhabiting a character. These experiences (and certain directors of children’s theatre) taught me that my disability disincluded me from storytelling, that my story wasn’t worthy of the telling. It wasn’t until I saw a VCR recording of Children of A Lesser God with the incomparable Marlee Matlin in high school that I realized that my childhood advisers were wrong. If there’s a space for Matlin, then there is a space for me; there’s a place for EVERYONE in theatre. It took 20 more years to accept that I didn’t have to hide my disability to work as an artist. Broadway and professional theatre are starting to come around to casting disabled actors acting roles for which they’re qualified. There’s still a lot of work to be done but knowing that artists like Hollander have commanded and will continue to command the stage for years to come gives me hope. Still Standing is a song cycle that relays Hollander’s remarkable, human journey from her cancer diagnosis through motherhood and to today. All the while she is performing, performing, performing, Hollander sings to backing tracks that allow her agile soprano to soar over mere mezzos. She’s gripping life by the cajones to wring out as much joy as she can while singing her heart out. She’s an inspiration to anyone seeking the courage to be themselves. Audience members should note that Hollander is not secretive with her disability: she dances, sings and reigns over the stage – like any other one-woman show. 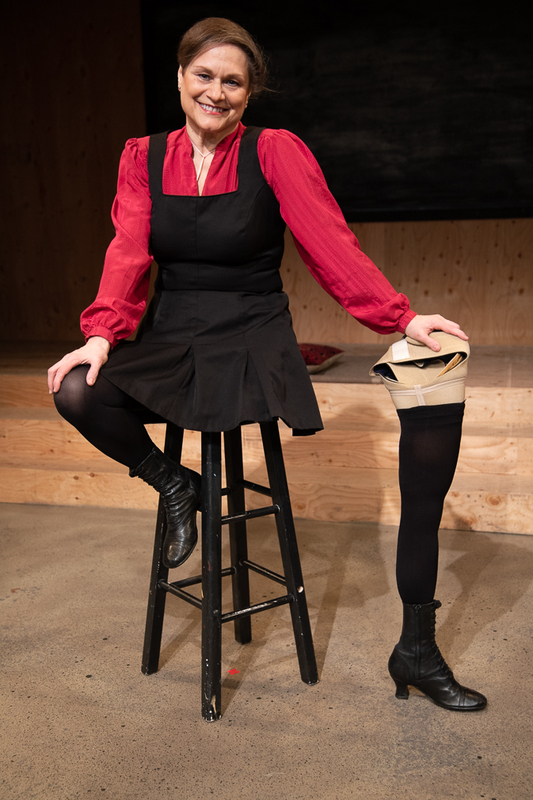 Unlike any other show, Hollander confronts the audience’s assumptions by performing without her prosthesis. “Walkman!” is about how the Walkman brought a groove back into Hollander’s step. “That’s the Way It Is” is about reclaiming her public body. We must remember that it’s Hollander’s show; More importantly, it’s her body; she’s going to use her time to tell her story her way. Hollander’s performance is gloriously liberated… But it may make squeamish audience members uncomfortable. The US Census tells us that 1 in 5 people are disabled. Everyone is at risk of disability; age, genetics, accident or other factors can cause disability regardless of race, creed, color, nationality, religious lifestyle choice, gender assignation, etc. The potentially disabled community includes EVERYONE. The big takeaway from Still Standing is that human experiences like pain and love are universal regardless of the human experiencing them. Hollander delivers an unabashedly personal performance that anyone who can should attend. Anita Hollander sells a CD of her performance before and after the show. It can also be purchased HERE. I highly recommend it. Anita Hollander graciously answered some interview questions for posting on the New England Theatre Geek (after a malicious iPhone ate the original interview). Thank you to New Rep and Hollander for facilitating our discussion! NETG: I am very excited to see your show! Without giving anything away, what parts of Still Standing do you find the most rewarding or cathartic? AH: Wow, I love your questions. The funny songs are extremely rewarding, because who doesn’t want to make people laugh? It’s fun to do them. The more serious & challenging songs are definitely cathartic, as they tell a story that not only I lived, but many of the audience have as well. AH: First of all, playing Grizabella as a 3-legged cat will always stand as a highpoint for me as a performer. As far as writing is concerned, we have a unique opportunity as people & performers with disabilities to tell a story many may not have heard, but all can relate to. Even though non-disabled people may not ever think they have anything in common with a person with a disability, through our writing, they find out they actually have everything in common with us. And when we can let our talents shine – as a writer/performer with a disability, we’re doing double duty, by enlightening audiences, both as great storytellers AND talented artists on stage/screen. People often tell me “I’d love this show for the pure entertainment value, regardless of your disability.” THAT is what we aim for. I will add though, that having a disabled actress play Grizabella (someone who can both nail “Memory” vocally AND bring an authenticity to a cat who’s been through something) is where a surface kind of entertainment becomes a deeply resonating experience in the minds and hearts of audience members, all of whom have experienced some sense of pain or loss in their lives. NETG: It is a joyfully affirming to know that a member of the disabled community is creating and sharing work as an artist and advocate. Could you tell me what it is you find affirming about performing? About performing for us? AH: 37 years ago my leg was amputated in Boston at Mass General Hospital by a world class surgeon named Henry Mankin (RIP), chief of orthopedic surgery at Harvard and MGH. Four weeks after losing my leg I opened in the musical “Jacques Brel is Alive & Well & Living in Paris” at Boston Center of the Arts. My life AND art were both saved within a single month. There real power in that knowledge. And I find it tremendously affirming that I am telling this story in this city now. PLUS, Jim Petosa (New Rep Artistic Director) had me perform this show 26 years ago at the Olney Theatre where he directed me in a world premiere of another musical (“The Fifth Season”) for which I got a Helen Hayes Award nomination. That’s a lot of affirming! NETG: We we discussed (on Friday, 2/8/19), all of us are at risk of becoming disabled regardless of race, color, creed, gender identity, sexual orientation, or any other factor. How does this fact impact your work as an artist? AH: People With Disabilities are indeed the Rainbow Coalition. We cross all boundaries of diversity. I’ve written a song for my NEW solo musical called “Just a Banana Peel Away,” humorously based on something a non-disabled man once said to me, implying that he and I were not that far apart as humans, because he could become disabled at any time, without notice and he knew it. I love playing with that idea as an artist AND as an advocate for people with disabilities in the entertainment industry. NETG: Do you have any words of wisdom to share with artists who identify as disabled who are considering a one-person show of their own? AH: You might want to come to my Dramatists Guild workshop “Going Solo” after the Sun 2/17 matinee! We need to tell our own stories. Too many times our stories are told on stage and screen by writers who know nothing about disability. When WE tell the story it’s authentic, real, true, and rich. I’d advise any PWD (Performer With Disability) to write their story, get help on it if necessary, find a director if you can, OR just go to an open mic, poetry slam, etc and start telling your story. It may wind up as a show! Best wishes to Anita and New Rep for a great run! This entry was posted in Comedy, Musical Review and tagged 2019, Anita Hollander, Children of a Lesser God, disability, February, Here I Stand, March, Marlee Matlin, New Repertory Theatre, Still Standing, US Census by Kitty Drexel. Bookmark the permalink.